Ring News 24Boxing News Breaking Boxing NewsFight Preview: Tony Bellew v David Haye II – Can Haye Make It 1-1? David Haye has been granted another opportunity to regain the type of heights he once enjoyed when he faces Tony Bellew in a rematch. He will try to turn back time on Sunday, December 17th at the 02 arena in London, the site of their first encounter. It has been reported that the former heavyweight champion would only accept if a clause was put in place for a third fight to happen between the two, although one wonders if anybody would seriously be interested in another should Haye lose once more. A “rubber match” has taken place in most cases when either fighter has one up on each other in their first two fights. David Haye wanted a third fight clause before accepting the rematch. There was a lot of build up to their March fight, the two boxers even coming to blows in their initial press conference which left a mark on Bellew after Haye landed a punch. But the Liverpudlian would have the last laugh when he was able to avoid many of his opponent’s wild hooks aimed upstairs and was effectively able to counter. 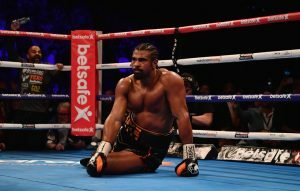 Things took a turn for the worse in the sixth round when Haye damaged his achilles heel and was felled. However, he managed to hang on until the eleventh when his corner, managed by head trainer Shane McGuigan, threw in the towel to show that any chance of turning the fight around at that point was virtually impossible after being dropped again. A deal was in negotiation for another match but fell through in August after promoter Eddie Hearn issued a statement. 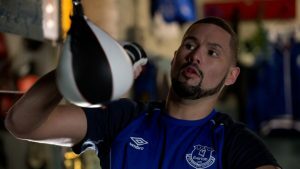 Bellew had been eyeing up champions such as Andre Ward and Deontay Wilder but nothing ever came of those. Though after another round of discussions, an agreement was reached for David Haye to avenge his third professional loss. His other two defeats came against Carl Thompson and Wladimir Klitschko. The Bermondsey man has been stopped in two of his three setbacks while Bellew has been beaten inside the distance once in two losses. Tony Bellew has unfortunately failed to secure fights with the big guns of the heavyweight division so far. David saw fit to part ways with Shane McGuigan after his loss to Bellew, saying that they simply were not right for one another in terms of working as a team. Cuban Ismael Salas soon stepped in. He has worked with the likes of Guillermo Rigondeaux and Nonito Donaire, but it is difficult to see what he can do to assist in turning things around. Haye is now 36 years of age and his body seems to be physically taking it’s toll. He has a history of suffering from physical problems including an injured shoulder which provoked many to urge him to retire. Before getting ready to fight Tyson Fury in 2013 he was cut in sparring only a week before the contest was to take place. He fractured his little toe before fighting Wladimir Klitschko in what was a heavily publicised championship bout, and then there was the achilles heel issue he got while fighting Bellew in March. When Haye is on top form he can be devastating at his best! The former WBC cruiserweight champion has enjoyed a generous amount of success during the last couple of years! Since his 2013 world title defeat to Adonis Stevenson, Tony has worked hard to get where he is at right now. He inflicted the first defeat on the record of Nathan Cleverly and picked up a couple of alphabet belts before taking the European crown. Bellew electrified the crowd when he knocked out Ilunga Makabu to win the WBC title, making one successful defense before the fight with Haye. He is at the top of his game right now and, should he come through the December clash, it would be hard to begrudge him an opportunity to fight for a world heavyweight title. But as a lot of people know, a boxer’s power is the last thing he loses! Even if Haye has trouble connecting with his bombs again, it only takes one to unsettle somebody. If Bellew comes into the ring overconfident and decides to be a little less careful due to his concrete belief that he can take David’s power then he may want to think twice about that. 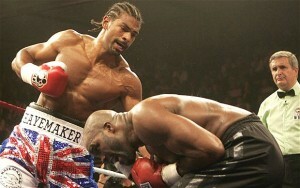 There is little doubt that David Haye has the power to knock out almost any heavyweight in the world. He has only been the distance twice. One of those twelve round victories was simply because he wanted to prove that he has the stamina to go the full thirty-six minutes and there is little doubt that he could have stopped Ismail Abdoul at any time. Bellew has given the crowd thrilling knockouts recently. Recent history does often lend significant clues to an outcome of a fight and unfortunately for Haye, his ring activity lately does not show much promise for December 17th. Tony Bellew should come through once more in a fight that may echo much of the way it’s predecessor panned out. Haye may even try to be more aggressive, which would just be an extension of his usual fighting method, because it is doubtful that he will make an exceptional change after boxing the same way all his career. Repeat is the desirable choice on the menu.